The Fordyce family are looking forward to the wedding of their eldest daughter when a strange woman arrives on their doorstep. Mrs Puffin claims to have premonitions in her sleep and is adamant that she knows what lies in store for the household. Her predictions are not what the family want to hear, and while the younger Fordyces are intrigued by her astonishing stories, Mrs Puffin doesn't prove to be quite as popular with their parents. How will the family deal with their uninvited guest? Will her visions become reality? Will she ever take the hint and leave them in peace?! 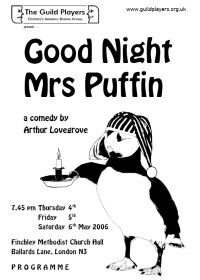 "Good Night Mrs Puffin", starring Irene Handl, was a 1960s comedy hit, running for over 2 years in the West End.